Favor from one person can change your life in 24 hours. The Bible is a book of words anointed by the Holy Spirit and filled with instruction. The instruction you obey will determine the blessings you receive. God loves words. He even named his son the Word. Your life is the result of how you respond to God’s instruction. You live in a world of corrupted thoughts that release confusion. This is why you have to change the way you think. Every renewed thought will open a new world of possibilities. The Bible is full of Kingdom principals. Acting on these principals unlocks God’s purpose for your life. One of those principals is the spiritual power of honor. Honor opens favor. Favor with God and favor with man. Favor leads to privilege, advantage, and wealth. Where you find favor, you find prosperity. When God wants to bless you, he brings someone into your life with a divine conversation. A divine conversation is orchestrated by the Holy Spirit and can change your life overnight. The instruction you need is found in the presence of the Holy Spirit. When you enter the presence of God, you enter the wisdom of God. One word from the Holy Spirit will propel you into a new season. This book is about wisdom, prayer, the power of honor, favor, fulfilled dreams, new seasons, divine conversations, and wisdom in the secret place. Get ready to break frustration, open God’s treasure chest of favor, and enter a new season. 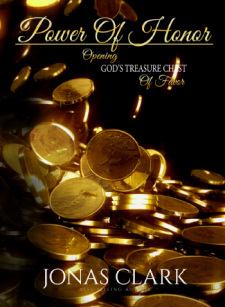 Click the button below to add the Power Of Honor - Opening God's Treasure Chest Of Favor (Physical Book) to your wish list.